Self-catering Chalet with 4 bedrooms and 3 bathrooms. Sleeps 8. Saturday changeover. 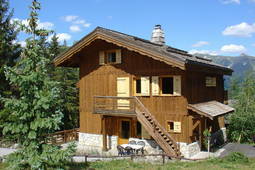 Self-catering Chalet with 5 bedrooms and 3 bathrooms. Sleeps 10. Saturday changeover. Part of Les Trois Vallées linked skiing system, Courchevel is well situated for both summer and winter vacations and offers activities to suit the seasons. Courchevel is part of Les Trois Vallées (the three valleys), the largest linked ski area in the world. Planned during the Second World War Courchevel 1850 was significant as it was the first resort in France to be constructed from scratch rather than based around an existing village. It was therefore able to be planned from a blank canvass. The altitude of Courchevel is 1100 to 1850 meters and the area includes the towns of Courchevel 1300 (Le Praz - the original village), Courchevel 1550, Courchevel 1650 (Moriond), and Courchevel 1850, which are named for their altitudes in metres. The highest point in Courchevel 1850 is in fact only 1747 meters but the name was chosen for marketing reasons to compete with Val d'Isère. The Courchevel valley also includes the town of La Tania, built for the 1992 Albertville Olympics. Le Praz hosted the Olympic ski jump in that year. Courchevel's location by the Vanoise National Park and rising 1850 meters, makes it a healthy destination to benefit from the effects of an alpine holiday. There is no need to be an athlete to take advantage of the mountains as there is a choice of mountain pathways or silent, ultra-modern lifts to take you as high as 2800m. Peace, relaxation and invigoratingly fresh alpine landscapes are there above all to help you unwind and recharge your batteries. Outside the large skiing areas of the resort, close to the high alpine pastures are the the wide open spaces, lakes and peaks of the first French National Park, created in 1963. La Vanoise is bordered by two valleys - the Maurienne valley, where the river Arc flows and the Tarentaise valley, the home of the river Isère. Saint Bon-Courchevel is in the Tarentaise valley. There are 28 towns and villages in the la Vanoise National Park. 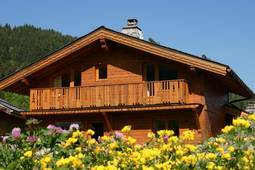 In winter the alpine pastures welcome holiday makers who love skiing and winter sports. During the summer, the alpine pastures see the arrival of the summer farmers who contribute to the local delicacy of 'Beaufort' cheese. Courchevel offers a wide variety of restaurants and shops. 60 or so shops are open during the summer season. The local and regional specialities are available in many places or eat at around 20 restaurants in the various resort levels.